History is always written by the conquerors, sometimes accurately, sometimes falsely. For latter examples one only has to look towards Turkey who confuses war with genocide. Equally one could look towards France and their inglorious, (tending towards genocidal) revolution. For the latter example the justification would be the cause of the Republic. The apparently less durable cause of Soviet communism killed many more millions. Yet if one looks closely enough into the history of nations, there are often such discords, less clamourous perhaps, but still questionable. The Battle of the Boyne in 1690, and the subsequent annual Orange Day march in Ireland (to keep the wound open and festering) is good example. For the US Confederates, their engagement would probably be less in support of slavery, than in support of a way of life. However just and reasonable the decree of abolishing slavery might have generally been appreciated, in the minds of those prepared to sacrifice themselves to conserve a way of life, were they not fighting for what they also consider to be their freedom? Ironically many Afro-Americans fought with them. They too, often accepted as part of southern families, having seen the children grow and having cared for them, might have been fighting for what they believed was their choice, their particular freedom, and Afro-American identity. Many of them subsequently 'freed', had no place to go and no offer of employment. For them would this be 'freedom'? Often they were also treated as scapegoats, the 'unworthy cause' of the tragic conflict between American brothers. Naturally this is not an apology for slavery. Oscar Wilde was quite right when he pointed out that the slave owners who did most harm, were those who were kind to their slaves, in as much as they contributed in perpetuating the abomination of slavery. Yet whilst imbeciles pull down statues of men who fought for what they believed in, the former brainless beings allowing themselves to be so used, are oblivious to the fact that slavery continues even today. The African migrants (many thousands of whom have drowned in the Mediterranean) being enticed to risk their lives and those of their families, to come to Europe to work, are hardly likely to get executive jobs. They won't even be accorded a minimum wage. Merkel pointed out the need for cheap labour in Germany. Isn't that slavery? Or are we to believe that being paid something, negates the argument? What cannot be negated is history. Only fools or regressive ideologues try to negate history. When people who, rightly or wrongly, fought fairly and nobly for what they believed in, and were respected for this, they deserve being remembered and commemorated. Desecrating such memorials is an act of hateful ignorance. Beings who demean themselves in this way trample on history and the essence of freedom. They trample on the notion of: "I don't agree with your opinion, but I would fight for your right to express it". They trample on the USA. In pulling down a statue of even a modest Confederate soldier, they are virtually pulling down the Statue of Liberty. The sculpture of Robert E Lee was first carried out by Henry Shrady (1871-1922). Due to chronic illness which led to Shrady's death, the work was completed by Leo Lentelli in 1924. It was dedicated in May of that same year. Apparently Lentelli's version is less animated than that originally planned by Shrady. 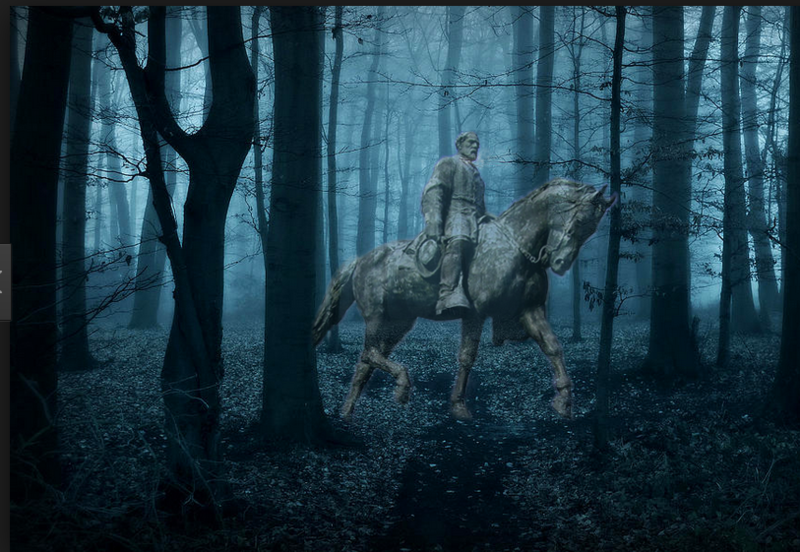 Composite © Mirino (using a cropped image of the equestrian statue of Robert E. Lee, and an image of woods in Virginia, USA, with thanks for their use). August, 2017. Robert Edward Lee (January 19, 1807- October 12,1870). After serving as a senior military advisor to President Jefferson Davis, Lee commanded the Confederate army and proved himself to be a fine tactician by winning battles against far superior Union forces. His later incursions into Union territory however, were less successful, most likely due to his forces being generally outnumbered. When he and his Confederate army finally surrendered, Lee's priority was the reunion of the north and south, and general reconciliation. Following the war he supported Andrew Johnson's project of reconstruction and mutual friendship. Lee was a popular war hero, and his popularity spread even to the north, especially after he died. There are barracks named after him at West Point, built in 1962. Of course in the 19th century communication was limited to telegraphic code. Nevertheless the general popularity of Lee shows how well informed, discerning and unbiased Americans then were, and this at a time when those who fought with the Union would have far more reason to hold grudges against Lee than immature morons today who have nothing better to do than destroy monuments of great men who, for very good reason, history chooses to remember. Had such pea-brains the minimum of common sense, they would first have checked out (very easily by Internet for example) what sort of person they wish to erase from history. The combination of ignorance and blind prejudice are fatal. Those who pull the strings to incite hate and division are well aware of this, and we all know who they are.